Ahihi-Kinau is a restricted and beautiful part of Maui in the southwest corner of the island that includes La Perouse Bay. It’s a nature sanctuary known for huge black lava fields, great snorkeling, dolphins, a road built of lava rocks called the King’s Highway or Hoapili Trail, and anchialine ponds near the ocean. Anchialine pond near the ocean. Rare cyanobacteria, tiny Hawaiian shrimp, and migrating birds can be found here. Anchialine ponds are landlocked bodies of water that have an underground connection to the ocean, so the water is brackish. Ahihi-Kinau also has significant archaeological and cultural sites. There are stories of a Hawaiian queen who bathed in one of the shallow ponds. In modern times, this area was used for WWII training and bombing, and is close to another island across the water, called Kahoolawe, which was also used for military training and bombing for decades after WWII. The biggest problems of Ahihi-Kinau include leftover military debris from bombing and training, wild goats that create a lot of damage to native plants, and people who hike on ecologically sensitive areas often bringing foreign plant matter, soil, or bugs on their clothing and shoes. Ahihi-Kinau is one of the few reserves in Hawaii that protects an entire lava flow from the source to the sea. You can read more about my experience volunteering at Ahihi-Kinau here. 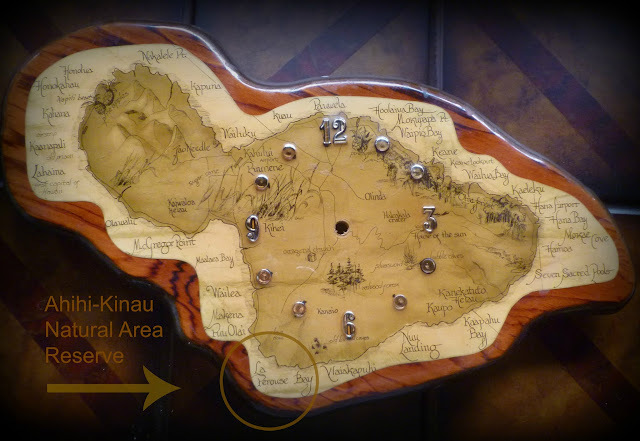 This is an old map of Maui, that is on a clock at my home, hands removed. The circled area includes Ahihi-Kinau Natural Area Reserve, which includes La Perouse Bay. Though it is not exact, it provides a general idea of location.This is the "southwest corner" of Maui although here we don't often use the terms north, west, south, or east when giving directions, preferring instead to use the Hawaiian terms mauka "to the mountain" or makai "to the sea."